Gold Coast, Australia - July 29, 2014 - STUDIOCOAST, provider of award-winning Live Production and Streaming Software, has released version 13 of vMix with a vast array of new features including support for the AJA KONA 3G with multiple 3G-SDI inputs and outputs, or utilizing all four 3G-SDI connections simultaneously in 4K mode. New software features include two independent full screen outputs, a new audio mixer with three dedicated buses and an enhanced MultiCorder for ISO recording with independent audio channels. 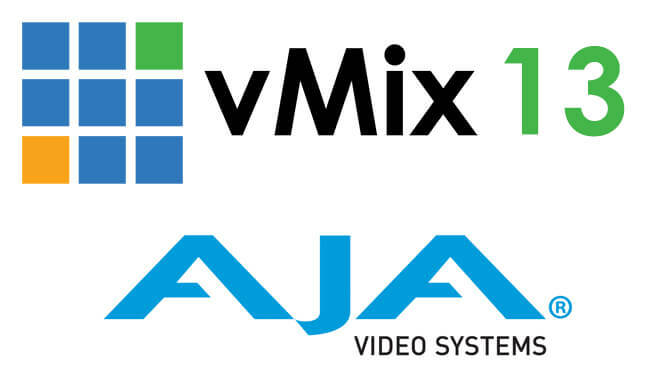 "vMix 13 is a major new release that incorporates many of the features suggested by our customers at NAB" says vMix developer Martin Sinclair, "we’re also proud to have AJA on board as a new hardware partner. The AJA KONA 3G has four configurable inputs or outputs that enable customers to use vMix at its full potential". vMix pricing starts from $55 USD for Basic HD up to $630 USD for vMix 4K. Support for additional AJA devices will be added over the coming months. Display any combination of Preview, Output, Inputs or MultiView on each display independently. Added headphones output with Solo control and two new independent audio buses in addition to the main mix. Each channel supports independent compression and gain. Record independent audio from each camera and split each recording at regular intervals. We’ve partnered with VirtualSetWorks to provide customers with a huge library of vMix compatible sets to purchase from.